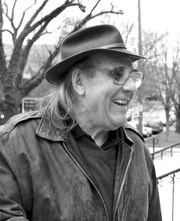 Preston Alexander Coiner (April 8, 1940 - September 10, 2012) served as vice president of the Albemarle-Charlottesville Historical Society and was the historian for the Board of Architectural Review. As a part of his responsibilities as a volunteer for Charlottesville's 250th Anniversary, Coiner oversaw the opening of the 1962 time capsule. He said that the biggest loss was the water damaged personal letters that he was looking forward to reading to the assembled crowd. Mr. Coiner was a graduate of Clark Elementary School and Lane High school. Until 2008, he was a partner in his family business, Coiners' Scrap Iron and Metal. Following his retirement that same year, Preston persued his interest in the buying and restoring of historic and residential properties. He was a member of First United Methodist Church. ↑ Web. 1962 Charlottesville Time Capsule Unearthing, Dan Gould, YouTube, June 3, 2012, retrieved September 23, 2012. ↑ Web. Preston Coiner is remembered by family, friends, Aaron Richardson, The Daily Progress, September 11, 2012, retrieved September 15, 2012. ↑ Web. Preston Alexander "Sam" Coiner, The Daily Progress, September 12, 2012, retrieved September 15, 2012. ↑ Web. Preston Coiner 1940-2012, Steve Trumbull, Charlottesville Then and Now, September 12, 2012, retrieved September 15, 2012. ↑ Web. Preston's Last Project, Charlottesville Then and Now, September 14, 2012, retrieved September 15, 2012. This page was last edited on 7 April 2019, at 14:31.